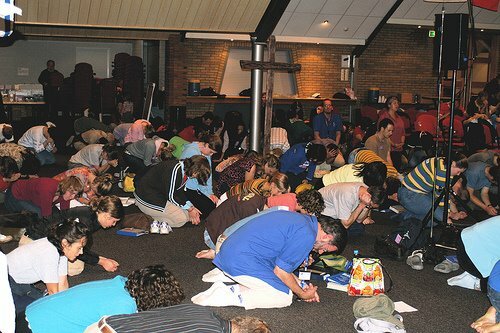 Yesterday we had a prayer day here at the conference. It was much-needed for me, as I had been neglecting prayer I needed in my life--both dedicated prayer and breath prayer. Prayer is like the fuel that powers a plane's engines. When we stop praying, there is nothing to propel us. The subtlety of prayerlessness is that we often don't notice because, like a plane, we still coast. But the descent, slow though it may be, begins the moment we abandon prayer. Eventually, when our communion with the Lord is cut off long enough, we crash. It takes a lot to crash--we often get our act together enough, soon enough, to avoid it--but why are we so easily satisfied with coasting near the ground when we could be soaring through the clouds? Spending some time in prayer yesterday served to reconnect and refill me. How quickly I forget the necessity of communion with God. At one point in the day, I wrote down some lessons - many of them lessons I need to keep re-learning. These lessons are me-specific, but I share them with you in the event that you can benefit from them as well. HUMILITY - be a friendly nobody. Learn from leaders and non-leaders who are humble. PRAYER - have dedicated prayer every day, and live prayer. Don't make prayer some thing; see it as relationship with the Lord. Make dedicated prayer creative. DISCIPLINE - always do what is best. Don't waste time and don't stay up too late. Get up early. LOVE & BIG-HEARTEDNESS - pray for the world. Invest in caring and seeing and experiencing global needs and tragedies. EXERCISE - do it daily. Plan. Jog, power-walk; do sit-ups and push-ups. THINKING TIME - take time to sit down and process things with a paper and pen. WISDOM - don't be foolish. Instead, seek wisdom for the sake of yourself and those who are affected by your decisions and life. SENSITIVITY - don't say stupid things. Avoid nationality-based comments. RESTRAINT - when in doubt, don't. Don't say it. Don't show off. FOCUS - Pray for re-focus. Lead conversations in eternal directions, or at least make sure that God is part of it. Have every conversation be something God can use.